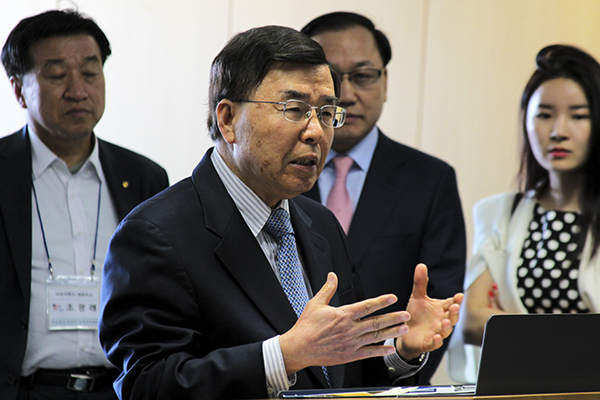 Updated: April 16, 2015 at 4:38 p.m.
South Korean business leaders mingled with business school professors Sunday to celebrate the kickoff of the Korean Management Institute, which will build partnerships between GW and Korean executives. The institute, the first formal institute of its kind connecting the GW School of Business to South Korean business leaders, will look to increase the school’s research portfolio and build alumni connections in a region that officials have pinpointed as a top priority. The institute will also include executive education programs, D.C.-based seminars for Korean officials and student exchanges, according to its strategic plan. A 16-member advisory board is leading the institute, which was proposed in October 2014 and officially approved last week. The board is made up of faculty, Dean Linda Livingstone and the chair of GW’s Korean alumni association, as well as South Korean executives from companies like the Korean Broadcasting System and Deloitte Consulting Korea. Faculty who helped create the institute said they were inspired after business school students traveled to South Korea on a class trip last spring. Paul Swiercz, the executive director of the institute’s executive team and chairman of the Department of Management, said officials hope to target alumni in South Korea and build on GW’s “high-profile brand” across Asia. Swiercz said he travelled to South Korea last May and signed a research contract last summer with CJ Corporation, a Korean conglomerate that brought in more than $17 billion in sales last year, according to Forbes. The executive vice president of the CJ Corporation also serves on the institute’s board of advisers. Swiercz is creating a case study on Korean business and management as part of the institute’s focus on boosting the business school’s research portfolio. And though fundraising wasn’t the catalyst for the institute, Swiercz said the programs could bring more donors to GW in the future. The business school is one of several schools across the University waiting to receive a naming gift. “The donor part is not a primary incentive for us, but certainly the University is supporting it because they want to support our alumni, and hopefully in turn our alumni will continue to support our University,” Swiercz said. Officials are still waiting on a pending $100,000 donation for start-up funding, according to the institute’s strategic plan. Hyundai Motors was “targeted” to make a significant contribution to that amount by March of this year, but faculty involved in the program said that they’re still negotiating the gift. Hyundai has made previous contributions to the business and engineering schools, including a scholarship for master’s students who “demonstrate a substantive commitment to Korea,” worth up to $5,000, according the the University’s graduate fellowship website. The business school also has ties to the Korea-based company Samsung through former chairman and billionaire Lee Kun-Hee, who earned a master’s in business administration at GW in 1966. He added that the institute will be effective in increasing communication between GW and South Korea. Park is a former board member at Samsung and used to travel to South Korea about 12 times a year. “The institute can open lots of opportunities for our faculty and students who are interested in that part of the world in terms of both research and career opportunities,” Park said. Over the next three years, officials plan to generate more than $275,000 through the institute, projections that would come from a fall conference, executive training and study abroad programs, according to the institute’s strategic plan. Livingstone, who did not attend Sunday’s launch, will travel to Seoul in the fall and meet with alumni there, Carnevale said. The program comes after GW’s plans to create a satellite campus in China failed. Former dean Doug Guthrie, who led the University’s overall strategy in China, was fired in 2013 after overspending the business school’s budget by $13 million. Following his departure, officials scaled back their aspirations for growth in China. Provost Steven Lerman announced the creation of a new position geared toward shaping the University’s international strategy last month, and his office will begin reviewing candidates by the end of the month. There has been no official in charge of international plans for GW since Guthrie’s departure in 2013. Ayman El Tarabishy, the director of strategy and development for the institute and an associate professor of management, said the programs were not prioritized over GW’s efforts in China and that both partnerships were equally important. “I think Korea is just something we as faculty have pushed forward and it’s working. It’s kind of like good serendipity. It wasn’t one or the other. It was just we go to Korea all of the time, it’s working out, and they said, ‘OK, let’s continue it,’” El Tarabishy said. El Tarabishy also said the institute could help officials better connect with South Korean alumni. About half of the business school’s master’s students this fall come from foreign countries, with 70 percent of that total hailing from Asia. More than 900 alumni live in Korea, according to the University’s alumni website. “It allows GW alumni that graduated and are professors to come back and say, ‘Hey, I’m going to engage with the School of Business again,’” El Tarabishy said. Soizic Hagege, a graduate student in the School of Medicine and Health Sciences, served as a teaching assistant for a social entrepreneurship course’s May 2014 visit to South Korea, where students attended a peace conference, visited South Korean companies and watched locals on Jeju Island dive for fish. She said the institute will help give GW students a sense of what business is like across the world. “You got to relate things from the class to something in the country every single day. You can’t do that in a class where you just come every Monday night,” she said at the launch Sunday. The Hatchet incorrectly reported that the Korean Management Institute’s advisory board included 18 faculty members. It actually has 16 members, and they are not all faculty. The Hatchet also incorrectly reported that the institute was the first formal partnership between South Korea and GW’s business school. The school will not have a formal partnership with South Korea. We regret these errors. This article appeared in the April 16, 2015 issue of the Hatchet.